More and more new Huawei LTE advanced pocket WiFi routers are available in the market, which would be the powerful competitor to the 4G modem router from Netgear wireless. Huawei E5885 is a new 4G pocket WiFi router at the end of 2017. Netgear AirCard 810s was available in 2016 and has already been the best seller in Netgear 4G Routers. Someone may ask: what’s the difference between the Huawei E5885 and Netgear AC810S? Which one to buy from the two mobile routers? In this article, we will review the appearance, interfaces, specs, price, and other features to answer the questions. Since the Aircard 810s was available in the market for around 2 years, you may already know the Netgear AC810s, which is the world’s first LTE cat.11 mobile hotspot. On the front, there is a 2.4-inch touchscreen with “Home” and “Back” buttons at the screen side. The touchscreen allows users to do simple settings for internet connection. The power button is on the top edge side while on the opposite side, two connectors for an external antenna and USB 3.0 port are located. Like other Netgear 4G WiFi routers, the two connectors are a TS-9 type. The back cover of the Aircard 810s could be opened and the battery is removable. Huawei E5885 may not be as well-known as Aircard 810s but it has unique features. Here now the market has only the E5885Ls-93a available. Not sure whether there will be a new variant model available in near future. The Huawei E5885 is thicker than common 4G mobile hotspots because it has a large built-in battery of 6400mAh. There is also a small screen on the front, but not touchable. The power button and WPS button are on the top edge side of the Ethernet port and USB ports. You much open the cap to see the ports. However, unlike other Huawei mobile router 4G, the Huawei E5885 doesn’t have the connectors for external antennas. The back cover could be removed but the built-in battery can’t be removed. The Huawei E5885 and Netgear Aircard 810s both use Micro SIM card size. The E5885 has also the Micro SD card slot for storage. 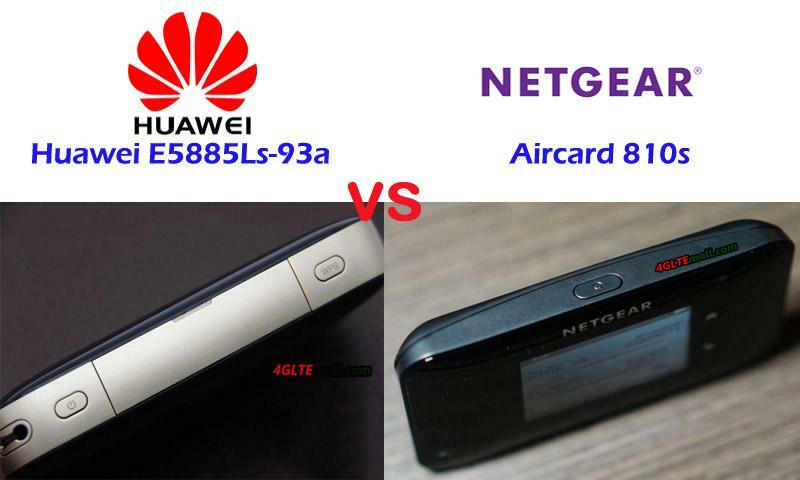 From the appearance, we can see the Huawei E5885 and Netgear Aircard 810s are very different. Then let’s have a review about the Huawei E5885Ls-93a specs and Netgear AC810S specs. From the specs table, we can see the new Huawei E5885Ls-93a 4G hotspot supports LTE category 6 while the old model Netgear 810S supports LTE Cat.11, which could achieve almost double faster speed than that of Huawei E5885. However, the Huawei E5885 has many features that are very powerful. Firstly, the Huawei E5885 has one Ethernet port for WAN and LAN, which would provide more connection possibility, especially when the 4G connection is not available and only an Ethernet connection is available. Secondly, the Huawei E5885Ls-93a could support maximum users up to 32 users while Netgear Aircard 810s supports only 15 users. Thirdly, the Huawei E5885Ls-93a has a large battery pack of 6400mAh, which would keep working for a long time and charge other devices. The AirCard 810s also has the JumpBoost, which is to charge devices. However, the battery of 2930mAh seems weaker than Huawei E5885 battery. However, the more advanced Netgear 810S has the same price as the latest new Huawei E5885. If you need a practical 4G mobile WiFi hotspots, Huawei E5885 seems to be more powerful and useful. But if you just need a faster internet connection, the Netgear Aircard 810s is the right one to recommend.